I'm baking this morning. 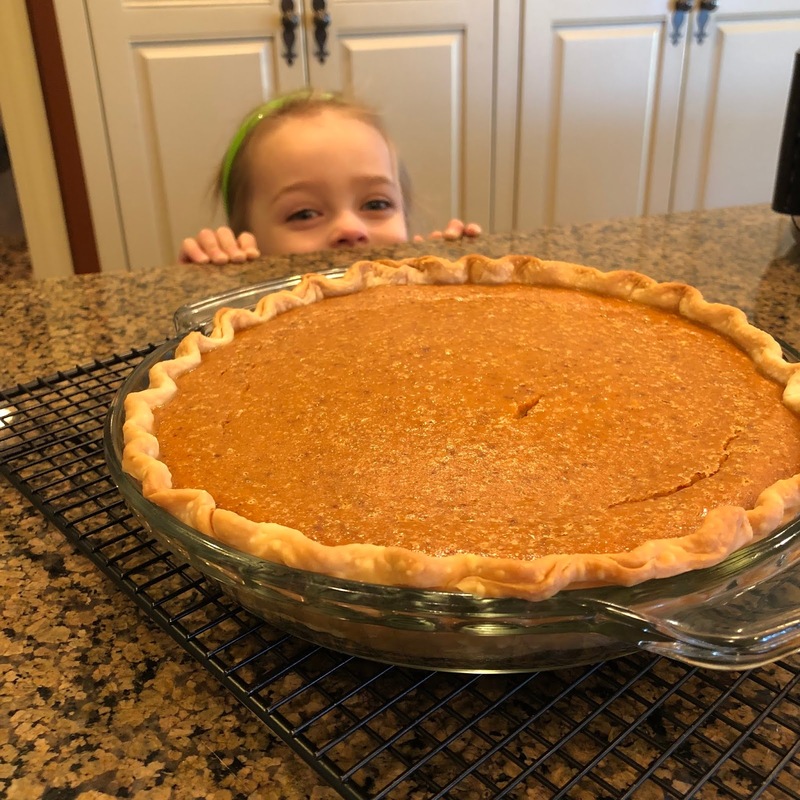 A pumpkin pie for tomorrow. And I nearly panicked when the recipe was not here on the blog. And it wasn't in the family cookbook that we use all the time. That book is so well loved that everyone's copy is falling apart. Then I remembered the original place I kept my favorite recipes. It was a blank book with a red plaid cover. My mother gave me the book for Christmas a zillion years ago with no particular purpose in mind. 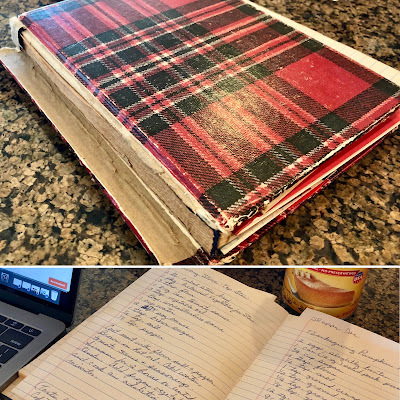 And back in 1979, it became my recipe book. Yes, I dated the recipes as I added them and made notes about where I served a recipe, and if it was part of a meal, I even listed the guests in attendance. I do similar things here on the blog now. But nothing will take the place of this tattered little red book. It's nearly a history of my life—the early edition. 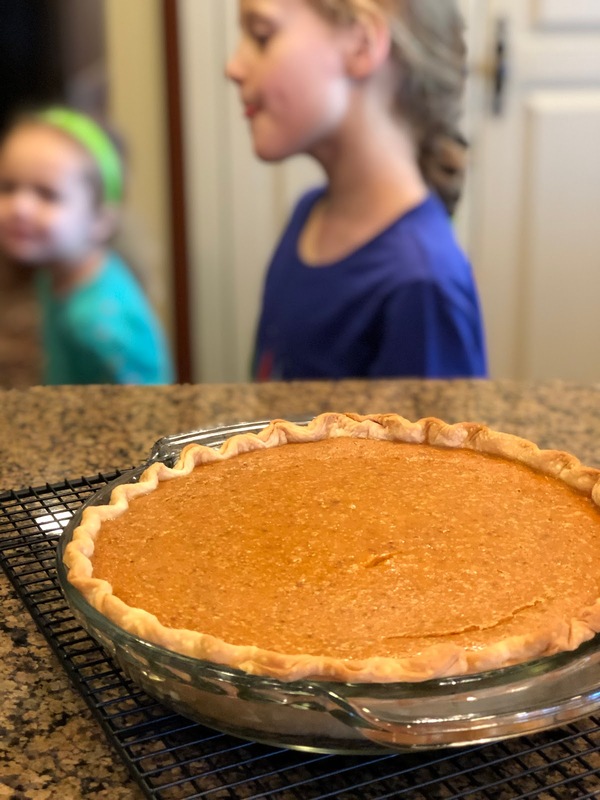 Anyway, to keep things where I search for them now, I'm adding my pumpkin pie recipe to the blog. This pie is very close to the classic one on the pumpkin can label. But I adjusted the spices years ago and added a little flour to give the filling more body. If you have the ingredients on hand, you've got time to do this pie for Thanksgiving. It's super easy. Just stir it all together. I used a refrigerated pie crust in a 9-inch pie plate. THANKSGIVING PUMPKIN PIE 2 eggs, slightly beaten 1 15-oz can of pumpkin (NOT the pie filling kind) 3/4 cup sugar 1 tablespoon flour 1/2 teaspoon salt 1 teaspoon cinnamon 1/2 teaspoon ginger 1/4 teaspoon ground nutmeg 1/8 teaspoon ground cloves 12-oz can evaporated milk 9-inch deep dish pie shell Preheat oven to 425 degrees. Mix filling ingredients in order listed. Pour into pie shell. Bake 15 minutes. Reduce heat to 350 degrees and continue baking for about 45 minutes, or until a knife inserted near center comes out clean. Cool on rack for 2 hours. Serve immediately or refrigerate. I find it helpful to measure out the spices before I start the rest of the mixing. And I stir together the spices with the sugar and flour before adding to the pumpkin/egg mixture. (That was a good job for my helper #1.) Seems to me that everything is easier to blend that way. Good luck with your Thanksgiving cooking if you are doing it this year. If something doesn't work out right (and I've already had that happen) just move on the the next thing. Either no one will remember, or it will be the story that everyone loves to tell from year to year. It works out either way. UPDATE: Mercy, I'm trying to do too much. This pie recipe was posted here last year. But without photos. Surely next year I can find it on one of these two blog posts!